Mechanical, plumbing and electrical design for two (2) new 16,000 square foot dormitories. A complete HVAC system was designed for both dormitories, consisting of boilers and a chilled water plant providing hydronic heating and cooling. Fan coil units were located in each dormitory suite. 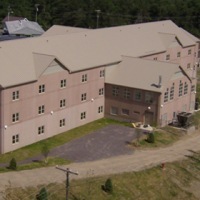 Air handlers were provided to supply fresh air to the system and exhaust fans were located throughout the dormitory and ducted to bathrooms and bathing areas, tied into a programmed control system. Electrical design included a new service entrance and all power distribution throughout each dormitory. A 1200 amp main distribution panel was designed to feed various power panels and branch circuits were designed from each power panel. Branch circuit design included HVAC, plumbing equipment, receptacle, and lighting circuits. As part of the distribution system, an emergency power system was designed to provide power to emergency lighting and life safety systems. Additionally, new primary overhead line extension to 1500KVA pad-mounted transformer. Lighting calculations were performed and foot-candle criteria was determined per IES recommended values. Emergency lighting was also designed to light paths of egress and illuminate exit signs throughout the dormitory. The building system design included a new central well-pumping system, building sanitary and vent systems, including effluent grinder pump station, building domestic water distribution system, central domestic hot water distribution system, LPG fuel gas piping system, and plumbing fixtures. The fire protection system design generally consisted of wet pipe sprinkler system coverage throughout the building utilizing quick response sprinklers in accordance with NFPA-13 and NFPA-13R.